It’s a bit of a running joke that hotel websites in Tokyo and the surrounds almost always reference views of the beloved Mount Fuji. 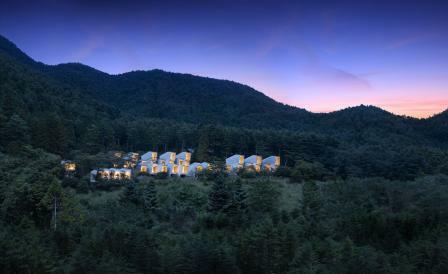 Here Japan’s fourth Hoshino resort has a legitimate claim to make, as it is located pretty much in the shadow of the giant. Nestled in the red pine forest, a collection of concrete cabins with vast front portals framing ethereal views of Lake Kawaguchi, and of course Fuji’s summit, were designed by Toky-based Azuma Architect & Associates while landscaping by Studio On Site comprises a series of white canopies connected to public platforms, some with fire pits and ‘Acapulco’ chairs, that climb up the hill towards a red truss-roofed lodge that serves as a café at the summit. The theme here is glamping, so bedroom interiors are minimal but luxe; done out in crisp white with soft furnishings in grey, teal and canary yellow. Each pod has its own balcony with bench seating and a small fireplace, making it the perfect spot for stargazing.